There is nothing more satisfying in my business then photographing for friends or in this case cousins of a close friend of mine. On top of it, this session was a gift to them, a surprise, that I got to reveal in a phone call upon baby Juul's birth. 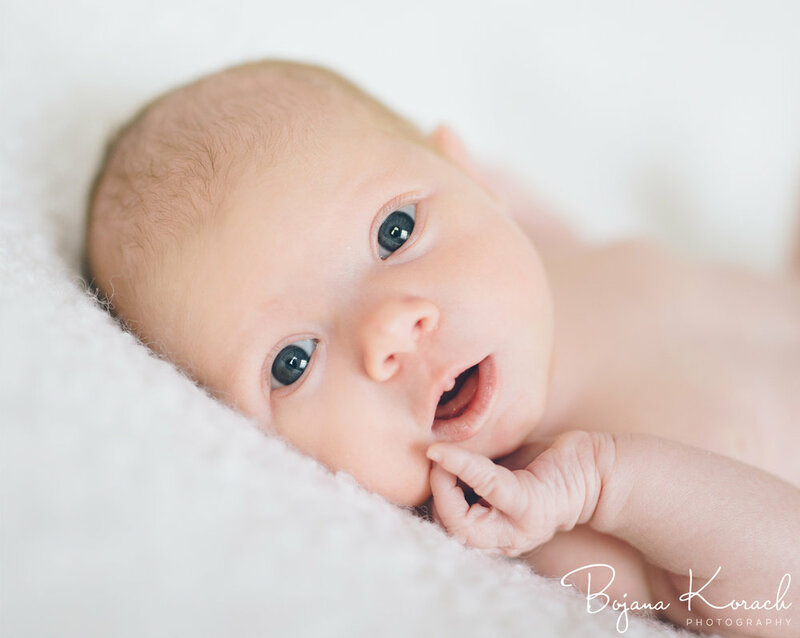 I had a wonderful time during this in home newborn session in a lovely Ukranian Village neighborhood of Chicago. It was so great to meet everyone and enjoy a few hours we had together. Most newborn photographers prefer their subject to be asleep. Not me! I really don't have a preference. I like to photograph babies as they truly are and this sweet girl was alert and engaged with the environment around her for most of the session. With her wide open eyes, she examined carefully what is going on. My camera clicking seemed to soothe her. Even at only two weeks old, she had a full array of expressions that I hope to have captured. Eventually, the sleep did win...at least for a few moments. My favorite images is the one right below. I love how little Juul struck the pose by placing her tiny hand right under the chin. Cute as a button!